Set of Four Rubber Feet for Sinclair ZX Spectrum (rubber Key) or PSU 24 days, 18h:31m:21s £1.50 Buy now! BT Merlin Tonto M1811 2 slot Rompack 23 days, 22h:23m:08s £25.00 Buy now! *BRAND NEW* Commodore Amiga A500 / A500+ Keyboard Membranes (56 A619A and 56 A619B) 15 days, 22h:09m:15s £22.50 Buy now! Sinclair ZX Spectrum Game: Operation Hormuz	 0 days, 02h:57m:28s	 £0.99 Bid Now! Sinclair QL QLUB News Issue 5 (May/Jun 1985)	 0 days, 03h:09m:41s	 £0.99 Bid Now! Commodore C64/128 Game Compilation: Five Star	 0 days, 03h:25m:58s	 £1.99 Bid Now! Commodore C64/128 Game : Gauntlet by US Gold	 0 days, 03h:32m:03s	 £1.99 Bid Now! Commodore C64/128 Game : Gary Lineker's Hot-Shot	 0 days, 03h:34m:03s	 £1.99 Bid Now! Commodore 64 Game: Olympic Spectacular	 0 days, 03h:40m:06s	 £0.99 Bid Now! Commodore 64 Game: Grandmaster Chess	 0 days, 03h:48m:14s	 £0.99 Bid Now! Sinclair ZX Spectrum Game: The Empire Fights Back	 0 days, 04h:23m:54s	 £0.99 Bid Now! Sinclair ZX Spectrum Educational Software: Fun School 4 for 5-7 year olds	 0 days, 04h:34m:07s	 £1.99 Bid Now! Sinclair ZX Spectrum Educational Software: Fun School 2 for the over 8s	 0 days, 04h:42m:21s	 £1.99 Bid Now! Commodore Amiga Educational Software: Fun School 4 for 5-7 year olds	 0 days, 04h:44m:25s	 £1.99 Bid Now! Commodore 64/128 Educational Software: Fun School 2 for the under 6s	 0 days, 04h:49m:29s	 £1.99 Bid Now! Sinclair ZX Spectrum Game: Jungle Fever by A&F Software	 0 days, 04h:51m:32s	 £0.99 Bid Now! 40MHz Oscillator Crystal - DIL-8 Format	 0 days, 04h:58m:51s	 £1.00 Buy now! 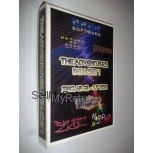 Sinclair ZX Spectrum Game: Rally Driver	 0 days, 05h:04m:44s	 £0.99 Bid Now! *RARE* Sinclair QL AZERTY Keyboard Upgrade by Pyramide	 0 days, 05h:08m:47s	 £5.00 Bid Now! RARE Book: Business Computing on the Merlin Tonto by Stephen Morris	 0 days, 05h:17m:02s	 £6.99 Bid Now! Amstrad CPC Game: Premier II Super League by E&J Software *RARE*	 0 days, 05h:21m:17s	 £3.55 Buy now! Amstrad CPC Game: Knight Games by Mastertronic	 0 days, 05h:21m:54s	 £4.55 Buy now! Rare BT Merlin Tonto M1887 Data Comms Adaptor	 0 days, 05h:23m:11s	 £2.99 Bid Now!